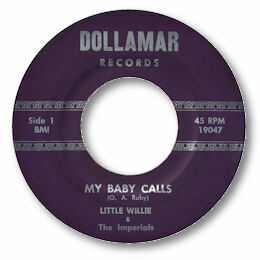 This is another Little Willie disc that I came across in my Willie Johnson hunt and is a well-arranged early deep soul track with some doo wop overtones. Willie Himself has a strong high baritone voice and the occasional ooohing background vocals are great. I like the chord changes a lot as well. The storming uptempo flip is more R & B than soul and pretty listenable too. Another obscurity well worth seeking out. Note ~ This isn't the same artist as the Lil Willie & His Rockin' Imperials on Golden, or this Little Willie here.